Unpack and unwind in a snug pet-friendly hotel room or suite at the Country Inn & Suites in Saskatoon, conveniently located near the YXE airport. You can store your favourite snacks and beverages in the in-room refrigerator and keep friends updated on your travels using free Wi-Fi. Kick back on plush bedding with your four-legged friend to watch a movie on the 37-inch LG TV or to read a free weekday newspaper with a fresh cup of coffee. Our hotel rooms also feature rollaway beds and cribs upon request for travelling families. Equipped with two queen beds and an open sitting area, the Two Queen Guest Rooms are ideal for sharing with friends or teammates. 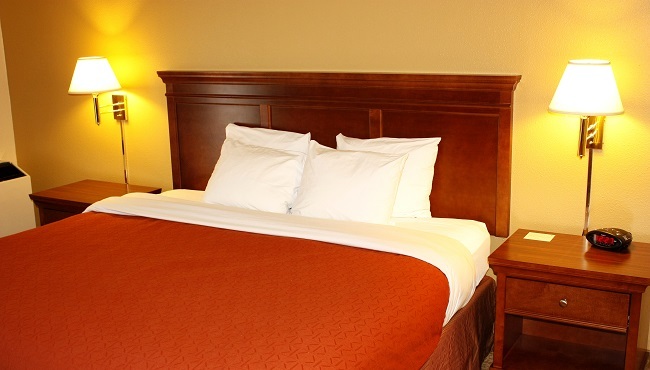 Enjoy all standard amenities plus extras like the option of having adjoining rooms. Offering a sprawling king-size bed, a comfortable sitting area and all standard amenities, our King Guest Rooms are ideal for overnight guests. These spacious suites offer two queen beds in the bedroom, plus a separate living area with a sleeper sofa. Our King Suites feature a bedroom with a king bed and a separate living area with a sleeper sofa. Travelling with family? Spread out in these spacious suites which feature a bedroom with a king bed, plus an expansive living area complete with a sleeper sofa to accommodate more guests.